It’s a chilly evening in October and you’re hurrying down the sidewalk, eager to get into your car and head home. All at once, the streetlight nearest you abruptly goes out, a cold wind ruffles your jacket, and a small black cat trots across the sidewalk directly in front of you. Thanks to the centuries of myth and lore surrounding black cats, this scenario still might rattle you a bit (even if you aren’t superstitious). 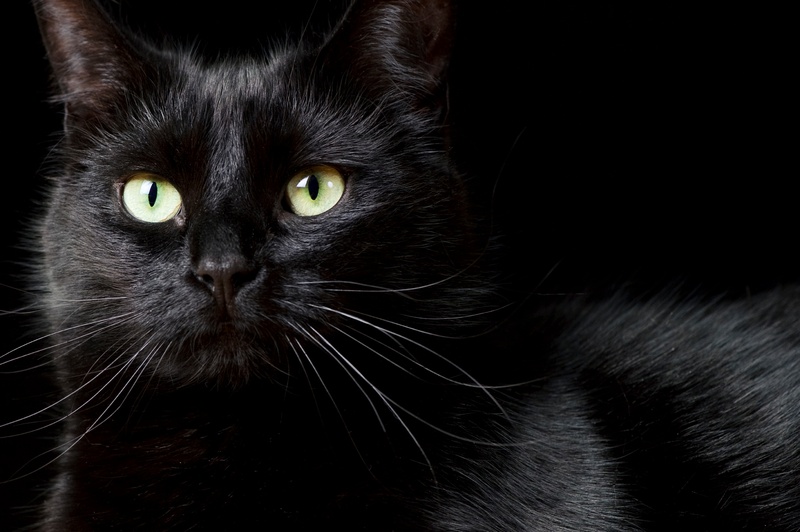 The view of black cats as harbingers of bad luck probably has its origins in witchcraft lore. In Western history, black cats were considered the companions of witches, or to possess the ability to turn into witches themselves, and were often burned alongside those accused of being witches. In truth, many cultures have myths and beliefs about black cats bringing good luck rather than bad. In ancient Egypt (roughly 3,000 years ago), people believed they could gain favor with the goddess Bast, who took the form of a cat, by hosting black cats in their homes. Ancient Greeks considered black cats an omen of death, as they were associated with Hecate, goddess of magic and witchcraft. 18th and 19th century Northern European fishermen believed a black cat on board would bring them luck at sea, and their wives often kept black cats at home for the same reason. In England and many Asian countries, a black cat is considered good luck. Black cats don’t photograph as well as their lighter-colored peers, and dark fur makes the cats less likely to stand out in a crowd of cats at a shelter. Because it is more difficult to read the expressions on the faces of ebony felines, people mistakenly assume the cats will be more difficult to bond with. Even in modern times, many people fall prey to the myths and superstitions surrounding black cats, making them less likely to be adopted. You can help combat black cat syndrome by considering a black cat the next time you adopt. Speak with family and friends about black cat syndrome and encourage them to consider adopting a black cat as well. Because black cats have long been associated with witchcraft, Halloween, and bad luck in the U.S., they are at higher risk for becoming the victims of pranks, abuse, or worse during the Halloween season. We recommend keeping all cats (black or otherwise) indoors in the days leading up to Halloween and especially on Halloween night. Because accidents do happen, and cats can easily slip out of an open door during the commotion of a costume party or trick-or-treating, make sure you update his or her microchip before Halloween. Have a safe and paw-some Halloween, from all of us at VitusVet!